Taken in the show of the Mill, at High Street. 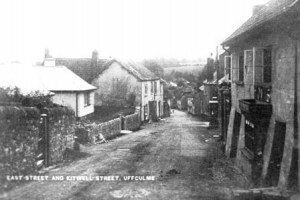 This picture looks south-east, down East Street, towards Kitwell Street, Uffculme. On the immediate right of the shot, is the old baker’s, owned by Mr Richards, at number 6 East Street – now a private home. The Culm Valley Railway lines heading towards the feed mill at Uffculme. We have contacted Lloyd Maunder to see if they can offer us any help on establishing some more information about this photo. They seemed very helpful when we called them and we await their reply. 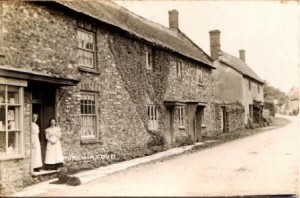 We know the family business began in 1898, although Lloyd’s father, FJP Maunder, was in the meat trade around 1879, in Witheridge, Devon. Some more about their history can be found on the Lloyd Maunder website. 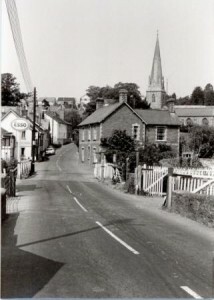 Little has changed in this view of Bridge Street, Uffculme. 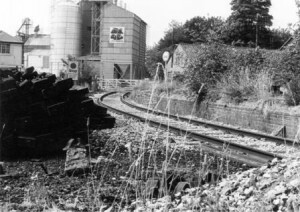 Probably taken in the early 70s, as the railway lines have been removed, although the level crossing gates are still shown. The Esso garage appears to have the name of the proprietor shown as Featherstone. Perhaps you can recall the Featherstone’s or are part of the family? 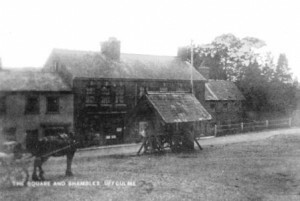 The Square & Shambles, Uffculme. Tiverton Industrial Co-op Society No. 2 branch (left). 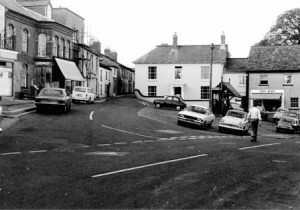 The car and Co-op may give clues to the date of this picture which is unknown to us, at the time of publishing. The Co-op branch is Tiverton Industrial No. 2. The much later picture appears to have been taken sometime around 1970. 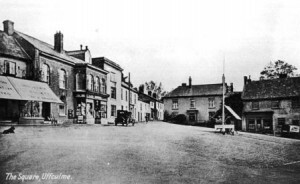 Clicking on the image will show the Square, as it is today. Picture the General Stores, Churchinford. The Churchinford village general stores, on Lisieux Way. Date not known.